The brash and flamboyant Sanders was a two-time All-American in college, where he also excelled in baseball and track. He was drafted in the first round (fifth overall) by the Atlanta Falcons in 1989 and was with them for five seasons. “Neon Deion” made an immediate impression both at cornerback, where he intercepted five passes, and as a kick returner, scoring a touchdown on his first pro punt return. He was selected to the Pro Bowl for the first of four straight seasons in 1991 and was a consensus first-team All-NFL selection in ’92 for the first of three consecutive years. He also split his time playing major league baseball with the New York Yankees and Atlanta Braves and led the NL in triples with 14 in 97 games in 1992. In the NFL, he was tremendous at coverage if not tackling and a fine kick returner who led the league in kickoff return yards (1067) in ’92. Through the 1993 season, he had intercepted 24 passes, with a high of 7 in ’93, and scored three TDs on INT returns and had also scored touchdowns on two punt returns and three kickoff returns. Sanders was occasionally used as a wide receiver on offense, with 11 catches for 160 yards and two TDs. 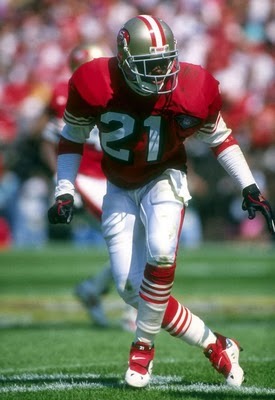 Sanders left the Falcons as a free agent following the 1993 season and signed a one-year contract with the 49ers for ’94. 49ers went 13-3 to finish first in the NFC West with the top seed in the conference while tying for the NFL lead in interceptions (23). Won NFC Divisional playoff over Chicago Bears (44-15), NFC Championship over Dallas Cowboys (38-28), and Super Bowl over San Diego Chargers (49-26). Sanders moved on to the Dallas Cowboys in 1995, where he debuted late due to arthroscopic surgery, but contributed to a NFL title. He played with Dallas for another four seasons and was a consensus first-team All-NFL selection three more times and a Pro Bowl choice in all four. After playing baseball for the Cincinnati Reds and San Francisco Giants in 1994 and ’95, he took the 1996 major league season off (he would return to baseball sporadically) and concentrated on doubling as a wide receiver for the Cowboys on offense, resulting in 36 catches for 475 yards and a TD. But it was at cornerback and kick returning where Sanders continued to excel – he picked off a total of 14 passes with Dallas, two of which were returned for TDs, and he also led the NFL with a 15.6 punt return average in 1998. Sanders played one year with Washington in 2000 before retiring, although he returned for two years with the Ravens in 2004 and ’05. Overall, Sanders intercepted 53 passes that were returned for 1331 yards and 9 touchdowns, and he averaged 10.4 yards on 212 punt returns with 6 TDs and 22.7 yards on 155 kickoff returns with three scores. He was a consensus All-NFL choice six times, received at least some consideration in three other seasons, and was a Pro Bowl selection 8 times. The player known as “Prime Time” could be a polarizing figure with fans and other players, but his talent was undeniable. Sanders was inducted into the Pro Football Hall of Fame, Class of 2011.